I know some of my readers are probably wishing that I would run out of family members to write about but the fact is, time is taking care of that, leaving fewer of us as each decade passes and I take great joy in making sure that each one of them has their “moment in the sun”. I have mentioned all four of my grandparents in my writings at various times and I have highlighted three of them with their own article: my dad’s father, the minister; his mother just last month; and my mom’s mother earlier last year before she passed away…but I have saved the best for last, and I don’t say that to mean that he was my favorite or that he was in any way better than the others-he was just the most interesting of all of them and he led quite a long and fascinating life. In my hometown, he was well known by a lot of people and I am sure their remembrances of him, when added to mine and those of my family could fill a book by itself. His impact on the lives of all of us left a deep impression and I know I was blessed to have him in my life. This posting will be longer than most I have written and it certainly has been worked on longer than I have worked on previous writings but I hope the extra effort will be worth the finished product…so come and listen to my story about a man named Toots…. He was born in 1907 which in itself is interesting considering that the President in office, Teddy Roosevelt, was not even a head on Mount Rushmore yet and Civil War veterans were still as common in our county as pine trees in Georgia. His life spanned the largest period of progress in the history of humankind and saw some of the greatest achievements and darkest moments of our time. He was one of 13 children and the youngest of all those that lived. He lost an older brother to war and his younger sister and brother to an influenza outbreak but from the time he was born, he was blessed with robust health and strength and used this to great advantage throughout his entire life. He was born into a poor family, raised in the shadow of the great Pepperton Cotton Mill, whose influence was widely felt by him through his formative years. Like many small towns in Georgia, cotton was an important industry and unless you were either highly educated, fortunate enough to have inherited money or one of the enterprising few who found a way out of it, your options were fairly limited to those who grew it and harvested it (country folks) or those who processed it and turned it into cloth (town folks). The “Cotton Mill” was the nucleus of small villages that always formed around it and the people who worked there were industrious, hardworking and loyal to the company. As was the case here, many large cotton mills would build small houses all around the plant and workers could rent these for a pittance, as well as purchase food, supplies and pretty much whatever they needed at the “Company Store”, which was owned by the mill company and provided these supplies to the workers for less cost than what they could get them for anywhere else. Men, as well as many of the woman and children, worked hard every day for wages that were pretty low but they could live in a company house and buy at the company store, which stretched their wages much farther. In this environment, a “mill village mentality” was often formed and residents tended to orient themselves internally, oftentimes shunning much of the world outside of the influence of the company. They built churches and worshipped together, married into other mill village families and socialized almost exclusively within their community. My grandfather was fortunate enough to receive basic education in a time when illiteracy was terribly high. Family needs were constant though and he only went to school for a few years before having to go work in the mill to help support the family. Even with the benefits offered by the mill, being in a large family always ensured that there was always a greater need than there were financial resources so he went to work at a young age and developed a very strong work ethic and sense of responsibility at a much earlier age than his 21st century contemporaries do today. He stayed in school long enough to learn how to read, to write and to calculate numbers in his head, plus a smattering of history; even with just these basics, he was better off than some of the “village boys” that he grew up with and you could earn a very basic living with this ability. He also liked to pick up extra jobs to bring in more money and one of them earned him the nickname that he would be known by for the rest of his life. In those days, there were not many cars on the road, nor many people who could afford them. Driver’s licenses were unheard of and pretty much anyone who was strong enough to crank one, turn the wheel and keep the car in the road could drive one legally. My grandfather had a lifelong love of the automobile and when he was barely ten years old, he landed a job as a driver for a local businessman that owned a car but didn’t drive much. The older man had earned the nickname “Toots” because of his tendency to “toot” the horn on his automobile as he drove it around town and my grandfather soon gained the nickname “Little Toots” because he was frequently seen with him. Later, when he was older, “Little” was dropped and he just became Toots. Being born when he was, he was too young to fight in the First World War but he remembered well many of the young men going off to war in Europe, taking a lot of them away from the mill, including some of his older brothers. One would not survive the war. The work continued and there was more of it since many of the men in their prime were not there during those years. Despite work, he found time for recreational pursuits and years of working in the mill, driving the large car and doing all kinds of odd jobs made him grow up very strong. He was of average height but very stoutly built and one of his other lifelong loves was baseball, a game that was very popular and highly affordable for the young men to play in the little spare time they had. They became so good at it, the little mill team became something of local legends as they played teams from other mill villages in area counties. 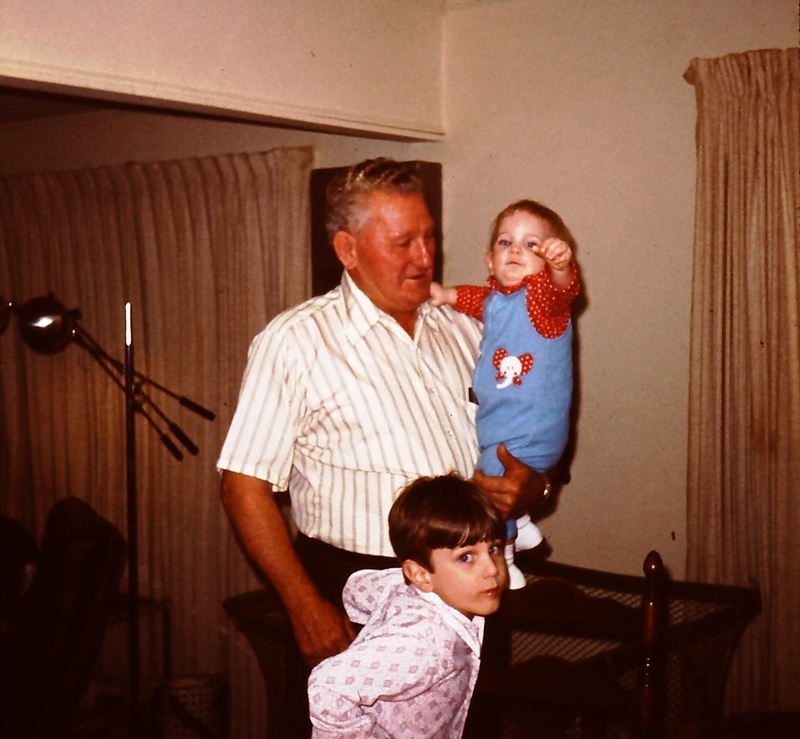 My grandfather was a superb baseball player and he was known for his ability to frequently hit home runs-in fact, when he would come up to bat, the neighborhood kids would head far out past the field hoping to be the one to find the home run ball when it landed. He and a close friend of his were something of a dynamic duo, my grandfather being a powerhouse hitter while his friend Otis could pitch a baseball faster than you could blink. He loved to work but he found the cotton mill to be monotonous and village life to be too confining so he began to look for other opportunities. His lack of education didn’t hold him back as he had been blessed with natural intelligence and the ability to learn anything necessary to help him with things that he set out to do. After a series of trying out different vocations, he settled on the restaurant business. 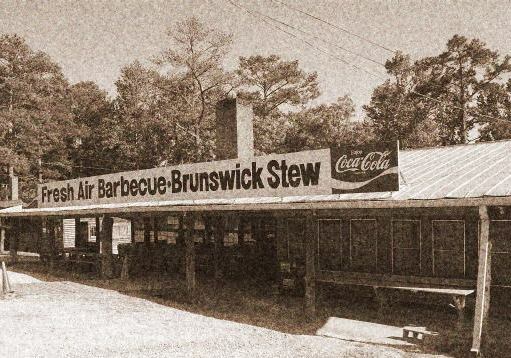 In 1929, a local veterinarian, probably seeking to supplement his income, opened a restaurant just south of Jackson, Georgia and a couple of years after that, my grandfather was hired to manage it and to cook barbecue for it. He also had a family recipe that had been taught to him by his own father for a concoction called Brunswick stew and he introduced it into the restaurant as well. Toots developed a savory barbecue sauce to go on the barbecue and in this way, Fresh Air Barbecue came into existence although it was known by several names during these first years. His hard work and excellent barbecue helped the restaurant to become established and he soon entered into a partnership agreement with the doctor where they both ran things on different days of the week and in adjacent buildings. The Great Depression started about this time but in rural Georgia, times had always been hard and therefore did not make as big of an impact for a few years-plus he and his family were already well equipped to deal with it, being familiar with making do with very little. Times did get harder though as the Depression became entrenched and Toots was lucky to have employment at the mill on the days he was off from the restaurant. In the early 1930’s, he fell in love with my grandmother, the youngest daughter of a successful builder whose family name dated back to when the county was first settled. She was ten years his junior and fearing disapproval from her parents, she climbed out the window of the house and they eloped one evening. Not long after, they were expecting their first child but sadly, just before the baby was due, my grandmother fell and the baby, a girl, did not survive. I remember him saying that the doctor told him the best thing he could do for my grandmother was to try for another baby as soon as possible and the next year, my aunt Charlotte was born. Just as he had been too young to fight in World War I, now at age 34 with a wife and a young child, he was considered too old to fight in World War II when it began in 1941 so he tended to the restaurant and his family, dealing with wartime shortages of supplies and doggedly pursuing his dreams of running a successful business. He enjoyed hard work and the ability to do it and after the war, prosperity returned and the restaurant had a good reputation for serving a high quality product. They didn’t expect they would have any more children but in 1946 my grandmother found herself to be pregnant again and the following year, my mother was born. My grandmother had spent the last ten years raising my aunt Charlotte to be the perfect young lady and Toots indulged her in doing this. It was different with my mother because in the time he was raised, a 40 year old man was perceived to be approaching old age and this was his mindset. 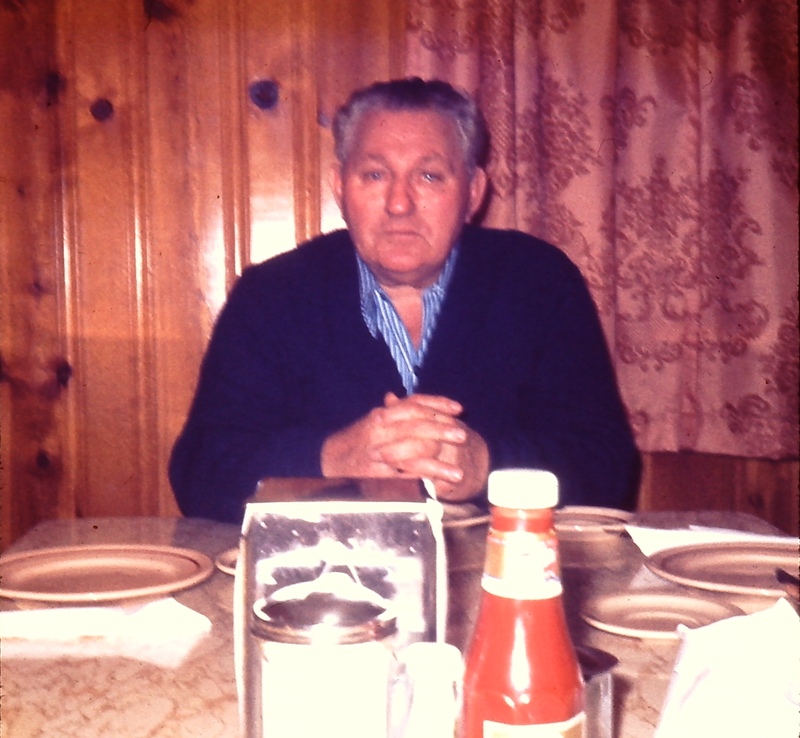 Feeling sure that he would have no more chances at having a son, he took a more direct hand in raising my mother and with the restaurant doing well, he had time to do some of the things he enjoyed like hunting and fishing. My mother was a frequent companion on these expeditions and from his hands, she learned how to shoot a gun, string a fishing lure, clean a fish, drive a pickup truck with a column shifter and much more. My grandmother tried to no avail to bend mother to her will, finally succumbing to the reality that her youngest daughter would rather shoot something that sew (although she can do that too). With a larger family now, he decided to build his first entirely new home and fortunately his father-in-law was a highly reputable builder. The sturdy, well-built brick house that would be his home for the rest of his life was not ostentatious by any means but it was handcrafted from the finest quality materials that could be found and built to last. 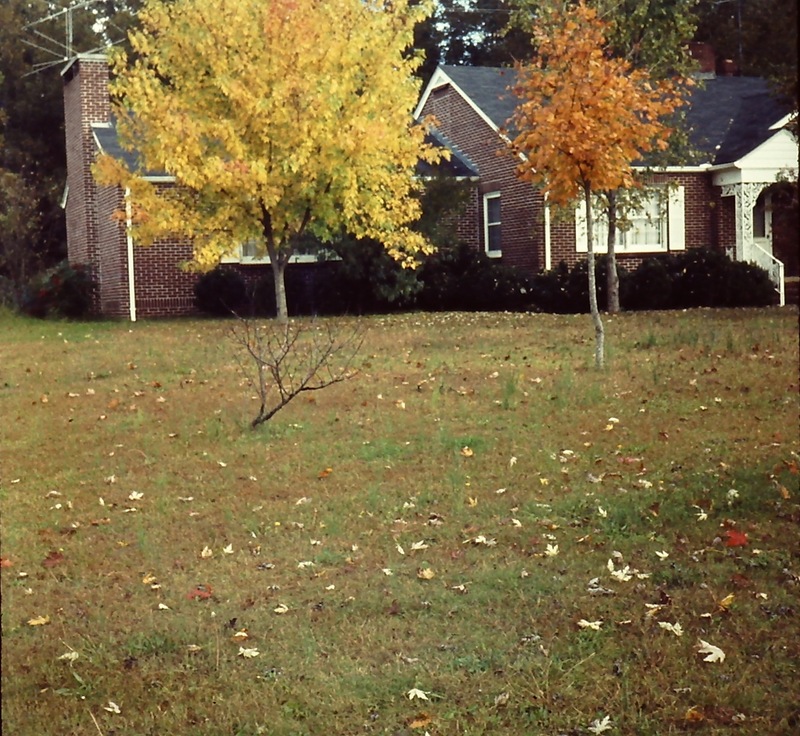 He had lived his entire life in homes either owned by others or pre-owned homes and he took enormous pride in his new house and his very large yard. As hard as he worked in the business, he worked equally hard in his yard and thoroughly enjoyed every minute he spent in it. For the focal points that people would see, he planted sugar maple trees brought down from Vermont and ginkgo trees, all of which are well known in our area for their beautiful fall color to this day. 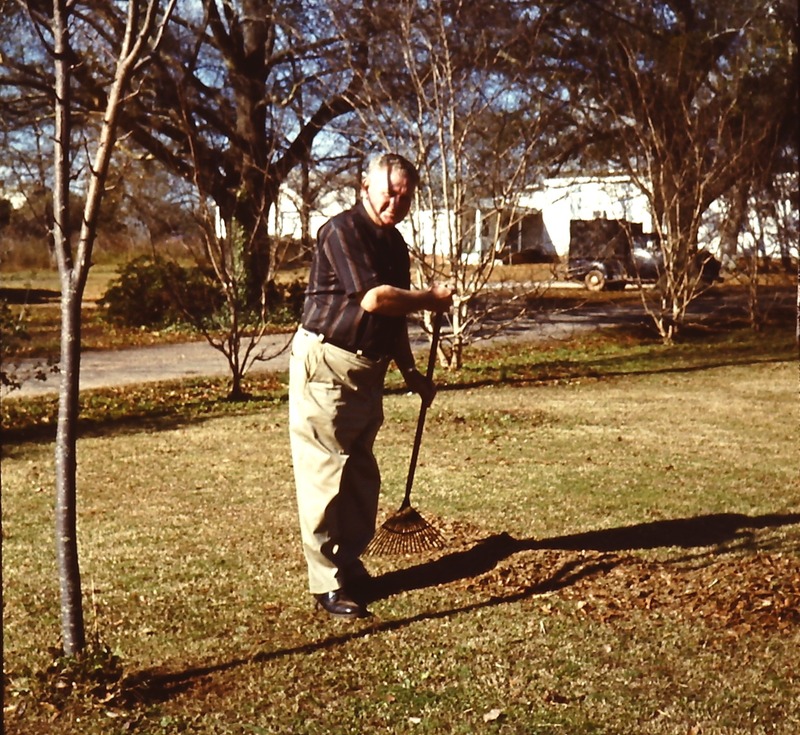 In the back yard, he had pecan trees and magnolias and out to the side, he planted fruit trees that produced pears and juicy plums that were enjoyed by all of us for many years. He built an arbor in that area and grew muscadine and scuppernong grape vines and there was always a vegetable garden for his wonderful tomatoes, beans and other things he enjoyed eating. He was always very happy when he was in his yard and after the work was done, he would rest in a lawn chair and survey what he had done that day and think about what he wanted to do in it the next day. He also thought about his future and where it might go. In 1952, he was 45 years old with a wife, two children and a new house to keep up. He wanted more for them than what he had and he was determined that they would have it, even if he had to deprive himself to do it. As it was, he didn’t have to think long because around that time, his mentor and partner in the restaurant died and his shares of the restaurant went to heirs who were spread out around the country, none of whom had an interest in a barbecue restaurant. Toots felt his course was clear and he tracked down all the heirs one by one, buying out each ones share of the business and the many acres of land that surrounded it. With full ownership of Fresh Air Barbecue, its final and official name, he could now make decisions alone without having to consult a partner and he focused almost exclusively on the restaurant’s two main products. He refined his father’s recipe for stew and developed the standards of ingredients still used today and he designed and constructed a new design for the pit to cook his barbecue hams in, employing a system where the fire was kept away from the hams but the heat and hickory smoke were forced into the pit, smoking the hams overnight to be fully cooked for each day’s supply of food. The pit he designed has been replicated brick by brick in all full-service Fresh Air Barbecue restaurants to this day. His sauce was pretty much perfect as it was and only one ingredient was added decades later when one of his grandsons poured some pickle juice in some sauce and discovered it gave it a nice extra kick. Finally, in 1956, he enlarged the restaurant by adding a new dining room so that patrons didn’t have to eat out in the “Fresh Air” if they didn’t want to. 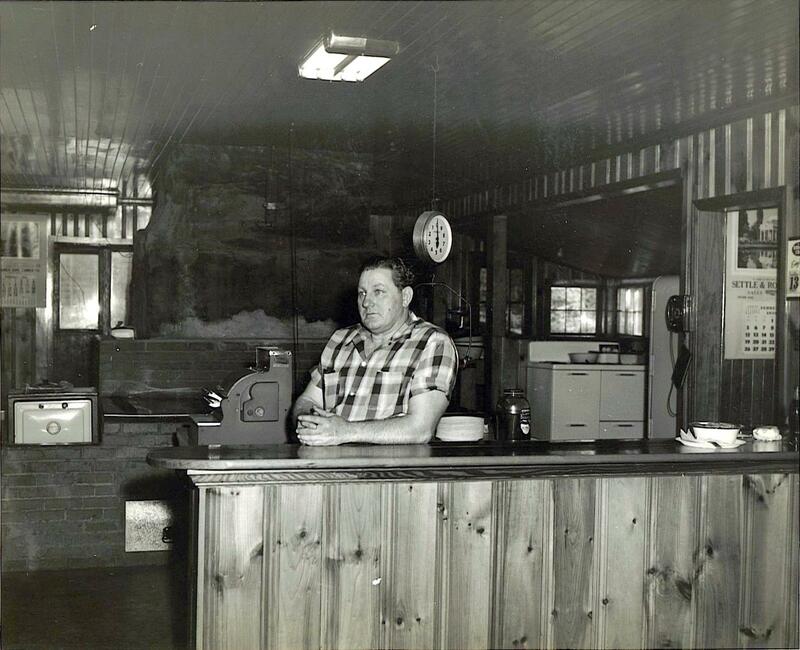 With his restaurant enlarged, his product and methods perfected and his reputation for producing what many consider to this day some of the best barbecue in Georgia, life was good but he was never content to sit on his laurels. Even though he was considered by the community to be a self-made, successful businessman, the hard years of his early life and the vivid memories of the Depression affected him, like they did many of his generation. He would never forget where he came from nor dismiss the value of a nickel, for he saw in money the value of all the hard work that went into making one. Just as his barbecue was cooked by fires that burned hot through the night, these lessons he had learned stoked the fires that burned within him and drove him through the day. With him, it was almost as if he was afraid that if he ever stopped working, his life would be over. Some people with this kind of work ethic would have found their health eventually ruined by working all the time the way he did but with him, the harder he worked the stronger he became and the more vigorous his health was. Sickness was something unknown to him and in his fifties, he could hold his own with young men in their twenties without missing a beat. He rose early each morning, well before the sun came up and headed to work, cooking, hauling in wood for the fire, peeling hundreds of potatoes and onions each week for stew, managing the employees and a hundred other details, putting in a full day’s work by early afternoon. He would then go home and spend several more hours working in his yard before dinner at 5. Bedtime came at 8:30 and the cycle would repeat itself the next day. He hired good, hardworking employees for his business and discovered that he could actually take some time off if he wanted to so when he did, he indulged himself with his fishing and hunting, two activities that he not only enjoyed but that I am sure he felt was time well spent as he always brought home fish or fowl, with my mother tagging along behind him. If grocery stores didn’t exist, I have no doubt that he could have provided well for his family on what he could grow, catch or shoot. He was never considered cheap but he was definitely thrifty and he didn’t believe in wasting anything that could be used for some other purpose. He never aspired to be a “big shot” but instead, measured his success by his own standards and avoided most things that might call unde attention to him. He didn’t mind my grandmother having fine things because despite the image she gave of always being “put together” when away from the house, he knew she worked very hard too, looking after their daughters, cooking meals every day, cleaning the house, making preserves, tending her rose garden and more. He would allow her some extravagance and his children a measure of it as well but for himself, he chose to confine himself to more simple pleasures…..with one very notable exception. He had loved automobiles since he first drove one as a child and I don’t know when he actually acquired his first car but by the latter half of the 1950’s, after what I am sure was major internal debate, he somehow rationalized the purchase of his first new Cadillac and would never consider anything else after that. For my grandmother, it was a status symbol equal to no other car; for my grandfather it was a pure indulgence that he no doubt justified by taking into account the high degree of quality that went into making one back then. Quality was something he aspired to in everything he made, everything he bought and every food item he sold. He believed in the inherent value of quality and a Cadillac fit right into that philosophy. He quickly cultivated a friendship with the owner of the Cadillac dealership and he traded cars every single year afterwards, up until the 1980’s when he went to trading every other year. He owned a total of 34 Cadillac automobiles over the course of 40 years and even when the quality of the cars dipped badly in the 1970’s and 1980’s, his faith in them as the best car you could buy never diminished. Back then, a Cadillac was not something you saw every day-in fact, according to my mother, when she was in high school, she hated if she ever had to drive it to school because it made her very self-conscious driving a car of which there were a grand total of four in the entire county. I remember my Dad came into possession of a nice ten year old Cadillac when I was 21 but he hardly ever drove it and I ended up with it most of the time. I obsessively polished it, cleaned it, preserved it and drove it all the time but my grandfather never approved of me having one, even an old one. I remember very clearly his saying to me one day when I told him I was thinking about buying it from Dad that “if you’re going to own a Cadillac, you’d best have the money to back it up”. While on the surface, his statement may have sounded snobbish, what he was saying to me was that if you have to put all your money into having a Cadillac, then you were pretty much all show with nothing else of any substantial quality or value. To this day, when I see a shiny new Cadillac parked outside of a run-down shack of a house, I remember his words to me. 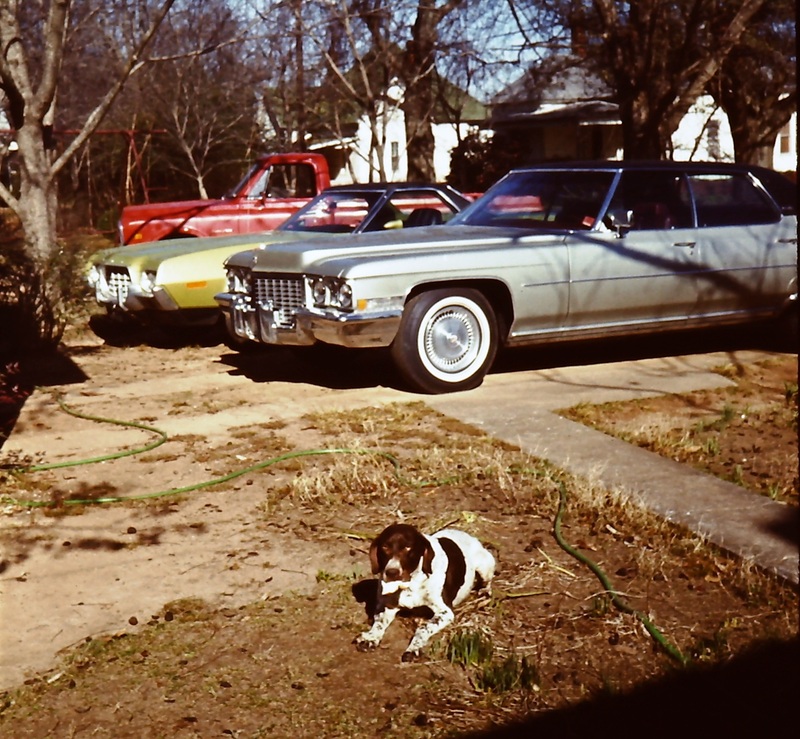 He also loved his pickup truck but to him, it was a tool and he ordered only the most basic models he could get most of his life until my grandmother convinced him to at least get air conditioning put in so she could ride in it. He not only did this but actually bought a loaded Chevrolet Silverado to make sure she was comfortable and this one he would drive the last ten years of his life. In 1959, he became a grandfather just two months short of his 52nd birthday and he was very proud to have a grandson to dote on. From this point, he began to mellow out just a bit and my grandmother wanted to see the country so he began to take some actual trips to see the world outside of Georgia. Loading up my grandmother, my mother, my aunt and her new son, he would travel to places a few times a year. A trip to Daytona Beach in the summer and New England during leaf season were always favorites of his and usually every couple of years, a long trip from east coast to west coast and back-always by car as my grandmother would never get on a plane. Of course, these trips were not always relaxing either because he did not observe different schedules for vacations than he did for work. I remember those trips that I went on, getting rustled out of bed at the ungodly hour of 5AM and then driving all day to get somewhere. He did not like to stop any more than absolutely necessary and I honestly believe his bladder had a ten-gallon capacity but from the window of a Cadillac speeding down the highway at 75 mph, I saw an awful lot of America. In 1963, a second grandson was born and in 1966 my mother added her first contribution to the family. It was not long after this that he decided to retire from the barbecue business as he really felt like he was past his prime at 60. My father had come into the family business as the General Manager so Toots felt like this was as good a time as any to step away from the business but after a couple of weeks, he was driving everyone crazy and it was with much relief to my grandmother that he decided to go back to work. Every year or two after that, he would decide to retire and each time, nobody believed it would last any length of time, which it didn’t. He settled for semi-retirement, which meant he still went to work at the same time every morning and just worked through lunchtime, seven days a week. These expectations were lived by him every single day of his life. He worked hard, his word was sacred to him, he never took anything, even credit, for anything that wasn’t due him and he abhorred wasting food. He wanted you to have as much as you wanted but don’t put it on your plate if you weren’t going to finish it. What a simple roadmap for life he put out there for us and did we really need much more than that? He believed in God and he worshipped God, never straying from his Baptist roots even as my grandmother went up the street to the Methodist Church but he never talked much about God. I guess he thought church and our parents would take care of that but he still was an example of honest, hardworking, Godly living. I can’t speak much of the relationship he had with my cousins and my brother; as I said earlier, each relationship was unique and different for each of us but my favorite time spent with him usually consisted of sitting in one of the lawn chairs in the yard and listening to him tell me how hard life was in the old days but the stories were never painted with dark tones and over all those many conversations, there was never bitterness, never remorse, never regret. I know today that what he was saying was not as important as what he was imparting to me-that just because a life is hard doesn’t necessarily mean that it has to be a bad life…..that you take what life gives you, you grasp good opportunities, you gain strength from adversity and you work hard…and that life can be good if you do. I think he also finally realized that it was ok to live more than 65 years and he lived on with gusto, slowing down only incrementally as the years went on but still doing far more than anyone else his age that I knew. In 1987, he turned 80 years old and his family decided to take him out to his favorite catfish restaurant. I arrived at his house first and was alarmed to find him 30 feet up in the magnolia tree pruning branches. I should have been frightened to see him up that high but I just shook my head and laughed because that was so typical of him. 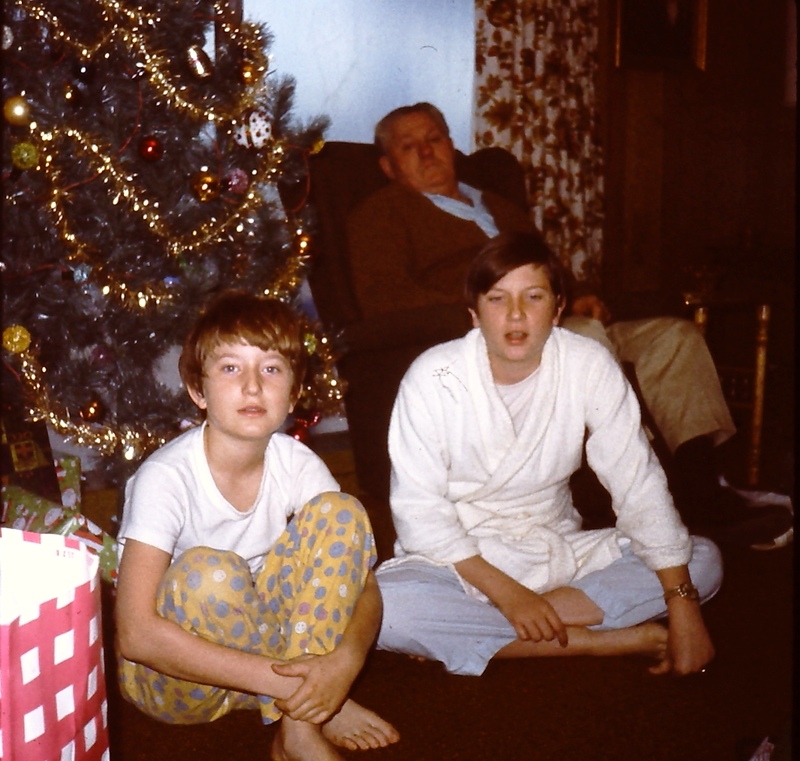 His boundless sense of humor and the mischievous look he could get at times dispelled any illusion of the stern, taciturn patriarch of our family. He said things that were humorous and unexpected. Once, in an interview with a reporter, he was asked why his parents had so many children. With that grin he got when something struck him as funny, he said “back then, you went to bed when the sun went down and I guess they didn’t have much else to do after dark”. He was not a man given to shows of affection but you knew how he felt about you as surely as you knew the sun rises in the east and sets in the west. Only one time in my life did he ever tell me that he loved me and I wouldn’t take anything on earth for it. Once was all I ever needed to hear it from him. I never heard him tell my grandmother that he loved her either-in fact, most of the time that I was around them, they argued and bickered all the time to the point of hilarity. Our regular Sunday lunches with the whole family tended to be better than going to a show because at some point they were going to be going at it with each other. An outsider would have thought they hated each other the way they went on but we all knew better. In 1990, my grandmother became seriously ill and we soon discovered that she needed bypass surgery, which was not as common then as it is now and actually was dangerous for a woman nearly 75 years old. The doctor was frank in telling us that we should be prepared for the possibility that she might not survive the surgery. They let us go down as far as the pre-operative floor with her and as we rode down the elevator, I saw two things that I will never forget as long as I live. She looked up at him from the rolling bed and he looked down at her and I saw a look pass between them as if they were in deep communication with each other. It was nonverbal communication between two people who I had never heard do anything but bicker and it was a beautiful. Then he reached over and took her hand and she clasped it and they rode the rest of the way down like that. There wasn’t a dry eye in the elevator after that except for his and hers. She came through the surgery with flying colors, recovered very well and life went on, arguing, bickering and all. He was proud of his family and felt that every investment in his life that he made had been paid back to him with interest. He also invested in others, always helping people who needed it, never asking for anything in return. Over his years, he built a successful, award-winning 82 year old business with a limited education, went in with other businessmen and chartered a bank that is now 47 years in operation and extends into two other counties and he probably owned more Cadillac cars than anyone I know of. He directly influenced two daughters and four grandsons who carry with them the lessons that he imparted to them, both spoken and by example and he lived to see the first three of his six great-grandchildren born and they feel his influence through their fathers. He lived an extraordinary life and he lived it almost to the moment that he died. In August of 1996, while the Centenniel Olympic games were going on just up the road in Atlanta, he got up to go to work. The day before, he had given a lengthy interview to a PBS journalist who filmed it as he talked about his life and his years in the barbecue business, one of many times he had appeared on television over the previous decade as his restaurant had become a landmark place. He no doubt was thinking about all he had not gotten done because of the inconvenience of having to do the interview and what he would need to do that day to make up time. As he made his way to his pickup truck, he stopped to check on his tomatoes and was felled by the beginning of a massive stroke. I was with him in the back of the ambulance a couple of hours later when they transferred him from our hometown hospital to Atlanta and it was there that I saw what made him who he was die as the stroke devastated his mind. The last thing he asked me was where my grandmother was and she spoke to him from the front seat of the ambulance. These were the last words he ever spoke. His body followed a couple of days later after all the family had left the hospital to get some food and he was alone in the room with my grandmother. He was 89 years old and we buried him in the cemetery that my grandmother had tended for years with his full name at the top of the stone and “Toots” at the bottom. It would not have been fitting to do it any other way. I have looked up to many men and women in my lifetime. Some have influenced me more than others, some just in different ways than others. Toots influenced my life in ways that I still do not yet fully comprehend but grow to understand more and more as time goes by. We are fortunate when we are given such examples to look up, to draw inspiration from and to emulate. He has been gone for almost 15 years and I still miss him very much, as does all of my family-but the signs of his presence here on this earth-children, grandchildren, great-grandchildren…..a restaurant that he poured his heart and soul into…….a house that he cared for with love…..beautiful trees, now as large as the house that come alive with New England colors every fall….. and an old, old pickup truck that none of us could ever bear to part with….all remind us that once, for a part of our lives, a great man lived among us and inspires us to this day. Just read this for the first time and thoroughly enjoyed it. Toots Caston and my father were good friends. When I was a teenager, I remember riding in the back of one of those Cadillacs when your grandfather took us to see a Braves game. I never realized he owned Fresh Air Barbecue until I started reading your blog. I’ve eaten barbecue all over the country, but my favorite is still Fresh Air. As a kid, I always looked forward to stopping there for lunch when Daddy would take me along with him peddling watermelons. Good times, good memories! Your posts have a way of making those memories fresh again. Thank you Julian…I appreciate it a lot. He was truly one of the most influential people in my life and certainly one of the most interesting. He did love his Cadillacs and the Braves so I can definitely picture that trip to Atlanta to see them. I’m glad that you found the article as it had been a few years since it was written. Thank you again for your readership!